The Greens have launched another policy today, to do with insulating houses in New Zealand. They have put particular focus on Christchurch houses. Unsurprisngly, considering the time of year it is, they have tried to use the Game of Thrones line, “winter is coming”. Other than that cliche, their graphic is pretty good. The Greens are once again lifiting the quality of their social media graphics. I blogged earlier about their door knocking graphic. I feel this one is a little heavy handed on the words, not as bad as the Labour one from last week, but still a few too many. They do have one issue though, the image that they have uploaded is rather small, when right click to save it the file is only 403 by 241 pixels. Now, normally for most organisations, this wouldn’t be an issue. However, NZ electoral law requires a promoter statement, and this promoter statement needs to be readable. Even when I blow it up to 400% in Photoshop, the promoter statement is not clear, it is there, but it just isn’t clear. I don’t think this is a purposeful decision by the Greens. I suspect someone has just uploaded a low res proof copy of the graphic, as opposed to the full res version they have. This happens from time to time, it is just another thing parties need to be aware of, and put systems in place to prevent this. 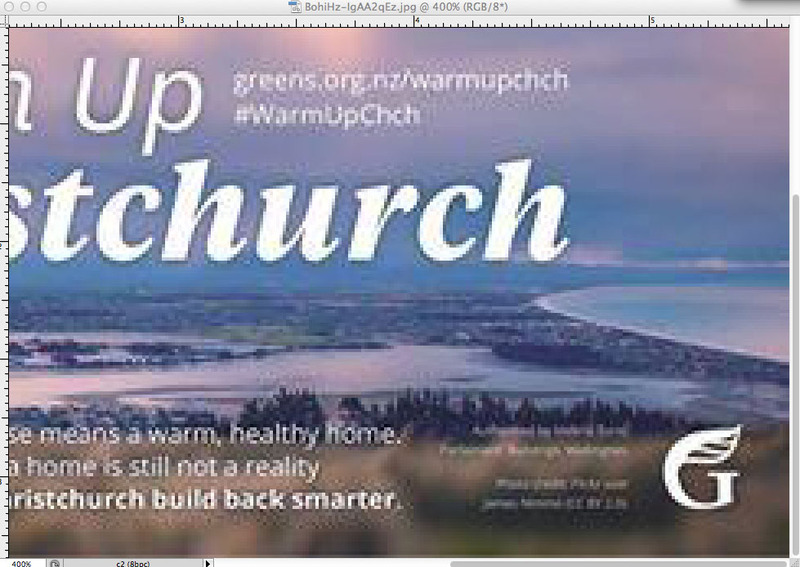 The Greens are also pushing a hashtag, #WarmupChch. It is being used, but mainly by Green MPs. The worry I would have is, a number of parties are trying to push a range of hashtags, which only they seem to use, is this diffusion of hashtags achieving anything for the parties? Or is it just putting the message in more places that it is unlikely to get seen by anyone? Previous Article← Twitter Conversation of the day: Clare Curran, Cactus Kate, Mark Mitchell.